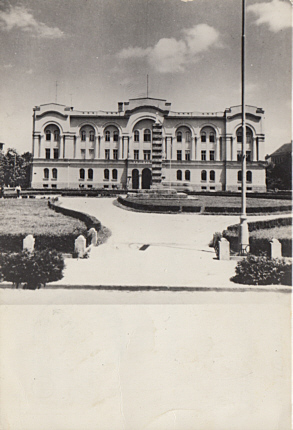 Built 1931-1932 as government seat of the Vrbas Banate ("Banski Dvor" = Palace of the Ban). 1953 converted to a cultural centre ("Radnicki Dom" = Workers' House or "Dom kulture" = House of Culture). 1969 damaged by an earthquake. 1972 restored. Used for concerts, exhibitions and other events. Reverse Text: "Banjaluka, Dom kulture"